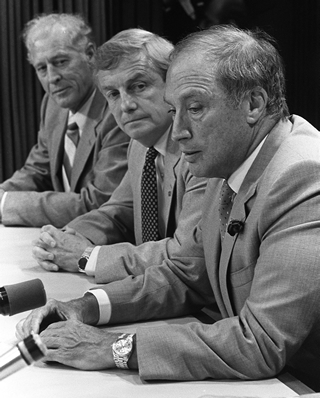 Atlantic Accord: A 1986 agreement between the federal and Newfoundland and Labrador governments that provided for joint management of oil and gas resources off the East Coast of Canada. 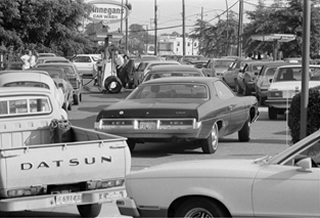 Bitumen: The heaviest, thickest form of petroleum. In Alberta the two largest known sources of bitumen each contain more petroleum than the entire proven conventional oil reserves of the Persian Gulf. 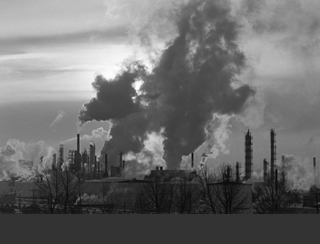 Synthetic crude oil produced from bitumen accounts for about 28% of Canada’s total oil production. Blowout: An oil well that goes out of control and literally blows out, spewing drilling mud, natural gas, oil, and other liquids out of the well. 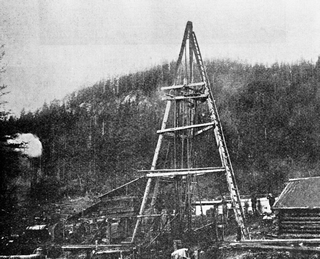 Cable tool rig: A device used to drill for oil and natural gas that used a heavy, chisel-like bit suspended on a cable and dropped repeatedly into the rock at the bottom of the hole. Canadian Association of Petroleum Producers (CAPP): The representative body of the oil and natural gas industry in Canada. CAPP represents 150 member companies. Catagenesis: The geological process, involving time, pressure and temperature, that causes organic matter (kerogen) to be converted into hydrocarbons. Cathead: A spool-shaped attachment at the end of a shaft, around which rope and/or chain, for moving equipment, is wound. Climate change: The alteration of long-term weather patterns. The phenomenon is caused by numerous factors, one of which may be human activity such as pollution. Condensates: Slightly heavier components of natural gas discovered at Turner Valley and refined into fuels. They were an early commercial product that encouraged further development of the field and construction of processing facilities. These hydrocarbons bridge the line between natural gas and conventional oil. Core analysis: The laboratory analysis of rock samples that are cut from an exploratory drill site or existing well and brought to the surface for examination. This examination is used to determine the capacity of the formation for oil and gas. 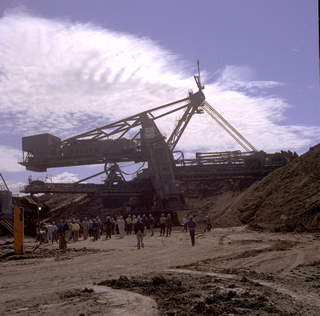 Derrick: A large load-bearing structure, usually of bolted construction (but once made of wood). It is erected over a well site to support drilling equipment and contain thea mast, which is used for raising and lowering drill pipe and casing. Devonian Formation: Subsurface Geological material formed during the Devonian Period of the Paleozoic Era (405 to 345 million years ago). This period was dominated by marine life. 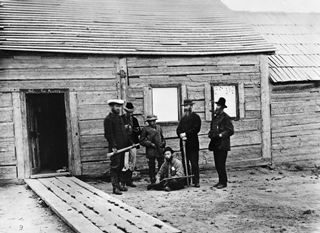 Much of the oil found in Alberta comes from rock formations from this period. Diamond bit: A drilling bit that has a steel body surface with industrial diamonds set in the cutting surfaces. Directional drilling: The technique of intentionally drilling at an angle from the vertical by deflecting the drill bit. 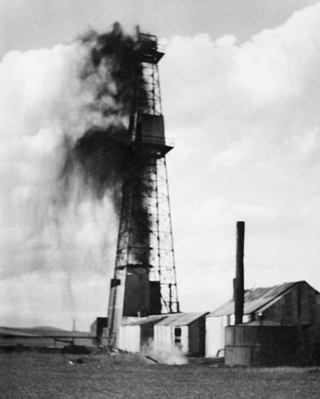 Discovery well: The first exploration well that locates a new petroleum deposit in a field. Distillation: A process by which crude oil is separated into its component hydrocarbons, purified and refined into marketable petroleum products. Dome: A geological, folded rock deformity that dips downward in all directions from the crest, like an inverted bowl. Drill bit: The tool attached to the lower end of the drill pipe. A heavy steel head equipped with various types of cutting or grinding teeth. Drill string: The drill string is composed of joints of pipe, along with drill collars, reamers, stabilizers, rubber fenders, and the rock bit. Driller: A senior member of a rig crew responsible for making the decisions about the drilling process. Drilling rig: A machine that drills oil wells. Drilling mud: A special mixture of clay, water, and chemical additives pumped down the hole through the drill pipe and drill bit. Dry hole: A well that is not capable of producing petroleum in commercial quantities. 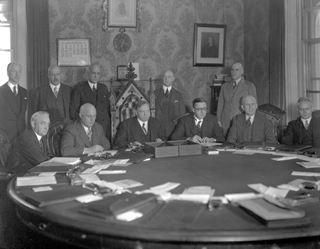 Energy Resources Conservation Board (ERCB): A board created in 1938 to oversee the development of the Alberta oil and gas industry and control economic waste. (This Board has also been known as the Petroleum and Natural Gas Conservation Board and also the Alberta Energy and Utilities Board). Flare: A tower or pipe used to burn off excess or unwanted natural gas from a well. Flaring: The burning of excess gas. Formation: A geological location where oil and gas are found in rock. Formation fracturing: A method of stimulating production by increasing the permeability of the producing formation. Also known as fracturing, fracing or fracking. Fractionated: A formation that has been opened with pressure in order to extract oil or gas. Gas oil: Term originally used to mean oil suitable for the manufacture of illuminating gas. Now used to designate an overhead distillate produce with an intermediate boiling range between that of kerosene and residual fuel oil. Gasoline: A complex mixture of relatively volatile hydrocarbons, with or without small quantities of additives, suitable for use in spark-ignition engines. Global warming: An aspect of climate change that specifically refers to the overall increase of the Earth’s average surface temperature. Brought about by natural events (ex. volcanic eruptions), and manmade causes such as the accumulation of greenhouse gases in the atmosphere. Greenhouse gases: Gases, such as methane (CH4), nitrous oxide (N2O), carbon dioxide (CO2), and water vapour) emitted from the extraction and/or processing of oil and gas that contribute to global warming. Gravimeter: A sensitive exploration instrument that measures the effect of gravitational force variations, or gravitational pull in a specific direction.Also known as a gravity meter. Gusher: An oil well that comes in under such pressure that it uncontrollably spurts oil and gas. Heavy crude: Thick, sticky oil with a specific gravity of less than 20° API. It is viscous, dark in colour and does not flow easily. Kerosene: A light form of oil distilled from crude oil. Often used for cooking and heating oil, as well as in solvents and jet fuel. Liquid Condensate Oil: A type of unprocessed crude oil that contains some quantities of natural gas. Magnetic survey: A procedure that measures and determines the strength of the Earth’s magnetic field at various points in a designated area. 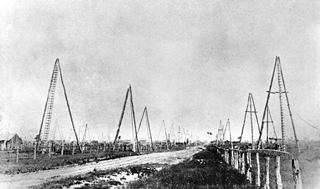 Monkey board: The derrickman’s working platform, usually about two-thirds up the derrick, from which he/she handles the top end of the pipe when it is being run out of the drill hole. Mud: The mixture of bentonite, barium sulphate, and other chemicals that is circulated to the bottom of the well during drilling to wash rock cuttings to the surface. 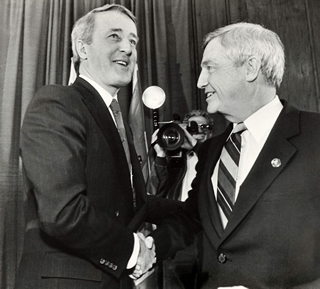 National Energy Policy: An energy policy developed by the Government of Canada to address the energy crises of the 1970s and 1980s by ensuring a steady supply of oil and gas for Canadian use by promoting domestic ownership of resource companies, instituting price controls, and encouraging exploration. 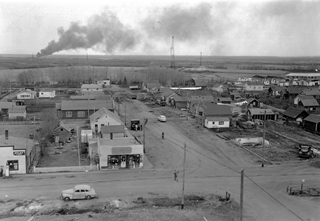 Western Canada, particularly Alberta, viewed it as unwarranted interference by the federal government into provincial jurisdiction. 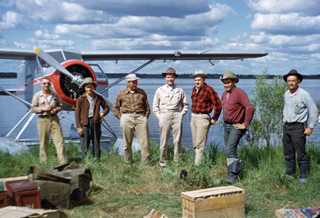 National Oil Program: An energy policy developed by the Government of Canada in the 1960s. 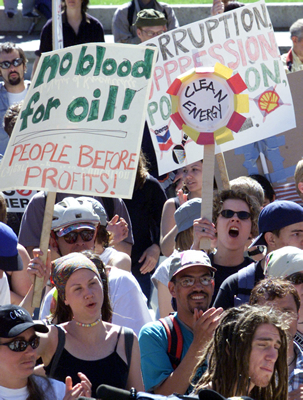 It aimed to encourage the development of Alberta’s oil sector by promoting exploration and keeping domestic prices high by restricting the imports of foreign oil. 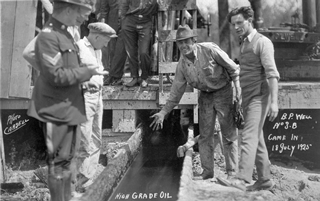 Naphtha: A high gravity form of petroleum (gasoline) produced naturally by a well. Natural gas liquids (NGLs): Ethane (C2H6), propane (C3H8), butane (C4H10), and condensates (heavier hydrocarbons) that are often found in natural gas. Some of these hydrocarbons are liquid only at low temperatures under pressure. 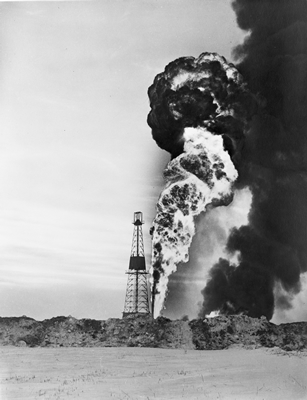 Oil patch: A colloquial term for the oil industry or certain parts of it. Oil seeps: Locations at which migrating oil naturally reaches the surface. OPEC (Organization of Petroleum Exporting Countries): An organization of certain oil-producing nations that aims to keep prices high through co-operative economic strategies, such as production and trade controls. Its member nations are Iraq, Kuwait, Iran, Saudi Arabia, Venezuela, Libya, United Arad Emirates, Qatar, Indonesia, Algerian, Ecuador, Angola and Gabon. Petroleum: Derived from the Latin roots, petra, meaning “rock”, and oleum, meaning “oil”. This is the general term for all the naturally occurring non-renewable hydro-carbons, including natural gas, natural gas liquids, crude oil, and bitumen. Pig: A device inserted into a pipeline that cleans and inspects the pipeline without stopping the transmission of oil. 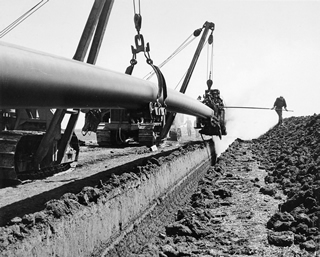 Pipeline: A conduit made from a series of connected pipes used to transport oil and gas over long distances. Pumping station: Machinery used to regulate the flow of oil through a pipeline. Reserves: Amounts of oil and gas in the Earth. Reservoir: A naturally occurring subsurface sedimentary rock formation that contains commercial quantities of oil and gas enclosed in or surrounded by layers of less permeable or impervious rock. Rig: The derrick and surface equipment of a drilling unit. This machinery includes the derrick or mast, draw works, rotary, pumps, and mud system. Rotary drill: A technology using a rotary drill pipe and bit, producing cuttings that are eliminated at the surface by a mud system. 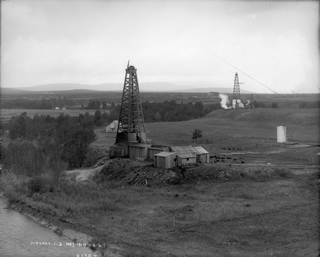 Rotary rigs: Drilling rigs introduced in Texas in the 1890s, Although they appeared in Turner Valley, Alberta, in 1925, they were not used widely in Canada until a new exploration in Turner Valley began in 1936. 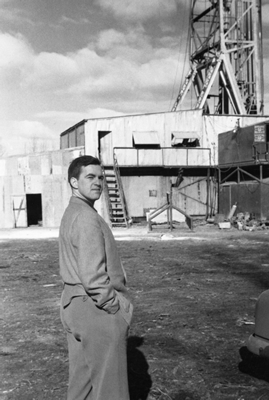 Roughneck: A word brought into Canada from the U.S. by the first American rotary tool drill crews, and meaning a member of the drilling crew who works on the derrick floor, up in the derrick or mast racking pipe, tending the engines and mud pumps, and on “trips” operate the pipe tongs. Seep: Hydrocarbons that migrate to the Earth’s surface. Seismic survey: A modern method in geophysics, based on the fact that sound waves travel through different kinds of rock at different speeds, used to find gas, oil, water, or minerals. Shooting: Exploding nitroglycerine or some other high explosive in a borehole to shatter the rock and increase the flow of oil. Also called Torpedoing. Shot point: The location where the detonation of a charge is made in seismic work. Sour crude: Crude oil containing over 2.5% sulfur. 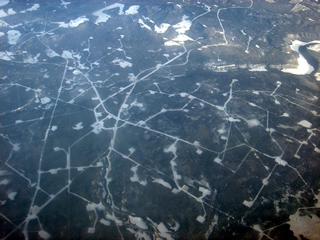 Sour gas: Natural gas that contains hydrogen sulfide (H2S). Source rock: Sedimentary rock formations where crude oil and natural gas are formed. Spud: To begin drilling operations, or begin making a hole. Spudding: The practice of hoisting the drill bit and then permitting it to fall freely so that the drill bit strikes the bottom of the well bore with considerable force. This is done to clean the bit of sticky shale that may have slowed the rate of penetration. Sweet crude: Crude containing 0.5% or less of sulfur. Sweet gas: Natural gas containing little sulfur or sulfur compounds. Terminal: An end-point or outlet of a pipeline where product can be removed from the pipeline for storage or loaded into different forms of oil transport, such as railway or truck tank cars or oil tanker ships. Tool push: A person who supervises the drilling of a well in the field and who has round-the-clock responsibility for all two or three drilling tours/shifts. Torsion Balance Gravity Meter: A tool resembling a dowser’s divining rod, used to locate oil and gas. 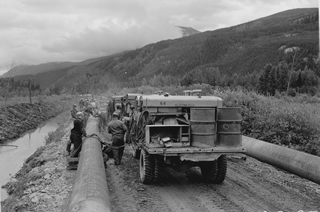 Transmission: Moving oil or gas through a pipeline. Upstream: That part of the petroleum industry that finds and drills for oil and gas. Waste gas: Natural gas that is flared. Wellhead: The equipment installed at the surface of the well bore upon its completion that contains the blowout preventer and tubular support devices. Western Accord: An agreement between the Government of Canada and the governments of Alberta, Saskatchewan and British Columbia, which ended the trade and pricing regulations of the National Energy Program and replacing them with free market principles. Wet gas: Natural gas partially saturated with liquid hydrocarbons, or light crude oil (gasoline). Wildcat: Drilling operations seeking new oil prospects outside regions of proven production.